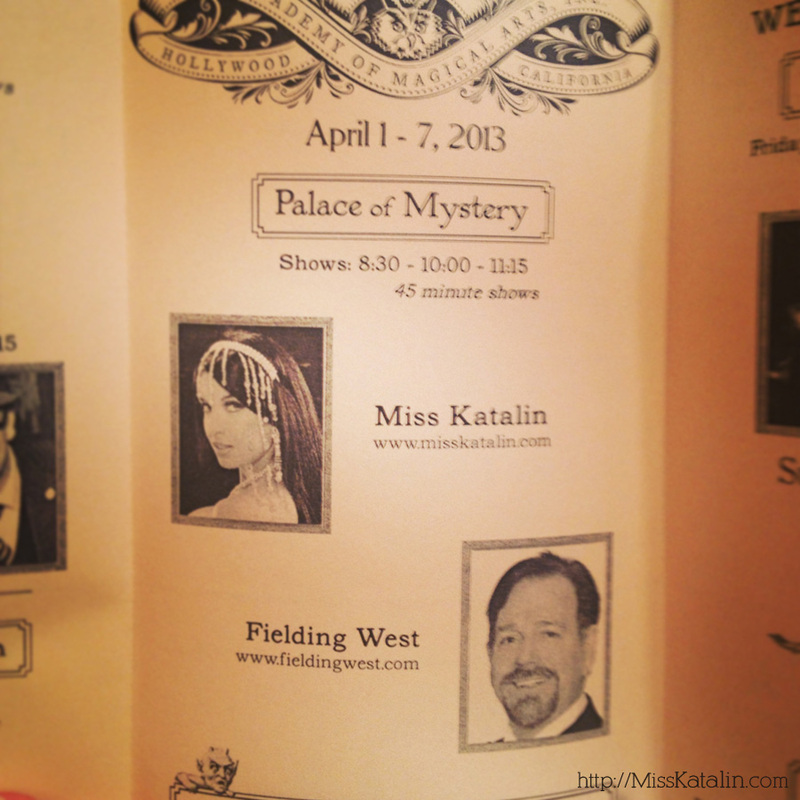 I had a crazy week, performing at the Magic Castle. Monday through Sunday, I’ve performed the total of 19 shows at the biggest stage of the Castle, the Palace of Mystery. I’ve also performed at the Saturday brunch, where the kids were able to discover this magical place. The program from the Castle. My first time performing with Fielding West! A photo during my performance at the Palace of Mystery. The first bite of food Monday night, after a very long day! A hero of mine, Juan Tamariz visited me backstage. He said he never seen an act like mine! Very original! Taking a break between shows. I’ve decided to perform at the Saturday brunch where all the kids were angels! However, I was so exhausted by the end of the day, that I had a hard time performing my 3 shows the same night. I had to cancel my Sunday brunch, in order to get my rest for the Sunday night shows. I believe it’s better not to do something, then do it poorly. In my dressing room before my last show, Sunday night! I was able to see my friends, Barry and Stuart perform at the Peller Theatre right after my shows. What a great night! Bye bye theatre! I had an amazing week performing here! Thank you for all the memories! Celebration Pineapple Upside-Down Cake Martini! YUMM! This week I’m recuperating and continuing my projects. Thanks for the Castle, I was able to reconnect with many of my friends! You look very pretty. Did you perform the same show during each of your performances?